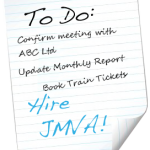 JMVA have certain expectations of it’s customers in order that a high quality professional service can be provided, in return as a JMVA client you can expect the highest level of commitment and service at all times. Below are a few simple guidelines that will ensure an effective working relationship leading to value for money and a successful partnership. Mission statement To deliver a professional, accurate and confidential service in a timely and cost effective manner to the highest level.